The significance of a bumper and ensuring that it’s in perfect condition cannot be stressed enough. This is why we strive to provide the best bumper repair service to customers in Sydney and beyond. Regardless of whether your bumper is made of thermoset or thermoplastic material, you can rest assured that we will repair and restore it thus ensuring protection of your car while on the road. The bumper of any car is in most cases the first to feel the impact of an accident thus making provision of the appropriate, safe and quality bumper repair service crucial. At Camperdown Collision Center, we provide the right equipment and tools and more importantly, the right team to ensure that the job is done right. One of the primary functions of bumpers is to protect the structure of vehicles, since they absorb the impact of the accident before any other parts of the vehicle. The service technicians at Camperdown Collision Center are trained as well as experienced in bumper repair and as such help restore your bumper to its original condition. The team ensures that they perform the right repair for each bumper meticulously. We help recondition your bumper, thus erasing any signs of indentations, scrapes, scratches and dents. Many plastic bumpers, especially the bumper covers, can be repaired. Restoring the bumper also allows our technicians to blend the appended pain more seamlessly and efficiently. Regardless of whether your bumper is made of semi-rigid plastic or rigid plastic, there’s nothing our personnel can’t repair with precision. This can also be achieved with thermoset or thermoplastic bumper, depending on the type of your car. Camperdown Collision Center relies on state of the art technology to repair and restore your bumper, unlike most traditional companies which simply replace the bumper thus costing you more money. Other benefits that accrue to our customers as a result of advanced technology bumper repair include saving on money, protecting the value of a car, saving on time as well as restoring the original parts of the car. And like all our services, bumper repair and restoration also comes with a lifetime guarantee. Thermoplastic bumpers are usually made by melting plenty of small plastic pellets then injecting the melted plastic into a mold. It is then allowed to cool before being released thus manufacturing a new bumper. Due to the fact that thermoplastic s are cost effective, easy to recycle and flexible, you will find that many bumpers today are thermoplastic. On the other hand, bumpers made from thermoset, or semi-rigid plastic if you prefer, are made by injecting different polymers into a mold, thus cross-linking them permanently. The end result is a durable bumper, which however requires skill, experience and extra care to repair and restore. Whether it’s a thermoplastic or thermoset bumper, be sure that Camperdown Collision Center will get it looking brand new. And as always, our team uses the latest technology for the job, and our services are backed by a lifetime guarantee. If you are in need of bumper repairs, you have come to the right place. Camperdown Collision Center offers services for car damage including but not limited to car restoration, panel beating, and spray painting. Bumper repair is also one of our major smash repair services. We get rid of dents, gouges, scratches, scrapes and scruffs that take away the appeal of your car. And rather than waste money on a new car, why not pick the phone and call us? Do you repair all the car models? We have experts that handle every known model of the vehicle. We can handle budget vehicles as well as high-end vehicles. We have a team in place that has the expertise on repairing anything from scratches, dents, gouges, scrapes and to scruff on any model of the vehicle. Contact us and we will advise. Do I need to contact my insurance provider beforehand? It is important to inform the insurance company as soon as you have an accident. Repairing the car before talking to your insurance company may lead to forfeiture the indemnity. 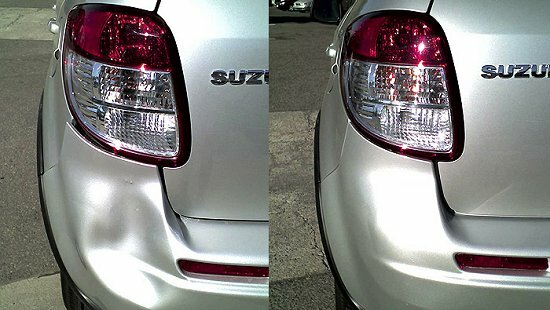 Do you restore the color of the vehicle after repairing the bumper? At Camperdown Collision Center, we have a variety of high quality paints to ensure that the car remains is restored to its original color as if nothing happened. At your request, we may also redo paint in other areas of the vehicle. What if my car was damaged beyond repair? If the vehicle was damaged beyond repair, we will replace the whole bumper with quality materials from authentic sellers of car parts. We also give a lifetime warranty for our parts, labor, and guarantee that the replaced part will look as good as the original part. We will advise if the bumper can be repaired on examining the extent of the damage on the car. The cost of the replacement depends on the cost of the vehicle part, which boils down to the model and the make of your car. How long will bumper repairs take? Bumper repairs take a few hours. Even in cases where we are replacing the whole bumper, we will not take long. If we have to paint the car, we will also give same day service depending on the time you bring your car for repair. We have the technology and expertise to work fast and efficiently.